Peppers ‘Buran’ (Capsicum annuum 'Buran'): growing, planting, caring. An old polish heirloom - better suited for temperate climates ! This heirloom pepper from Poland is one of the sweetest you can grow. The 18-24 inch tall plants produce three lobed peppers about 4 inches long. The green fruit are quite sweet. Perennial, frost-sensitive plants with white flowers, square stems and oval leaves, part of the Solanaceae family. The leaves bring to mind potatoes, but the stems are shorter! Start your seeding under a heated shelter or inside starting in February or March under a greenhouse or window. Sow a small pot with a fine mixture of soil and potting soil or in compost for sowing by placing 2-3 seeds in each container. Water in a manner that keep the surface slightly damp (not soaked) the first weeks. Advice: in theory, the seeds sprout at 28°C. Thus, you can place clear plastic covers over your seedlings to create a greenhouse effect. Sowing outside is only possible in warm climates - when temperatures exceed 25 ° C, sow directly in the sun, in fine soil mixed with sifted compost. Place several seeds in each hole, and cover very little. Water gently, you will have to keep the soil moist the first weeks. The seeds rise to 28 ° C in theory; so you can put clear plastic covers on your seedlings to create a mini greenhouse effect! Plant under a cold frame in April or May according to the temperature (it must be more than 20°C), placing the plants 50 cm apart in direct sunlight in well drained fresh fertile soil. If you don't have a cold frame, wait until May-June and plant in the ground in the same type of soil. In May-June according to the temperature (it must be more than 20°C), placing the plants 50 cm apart in direct sunlight in well drained fresh fertile soil. Water well and mulch the plant with some comfrey leaves. When the seeds have sprouted and have some leaves, thin them out so that this is only one per small pot. Water preferably in the morning to avoid cooling the plants at the end of the day. 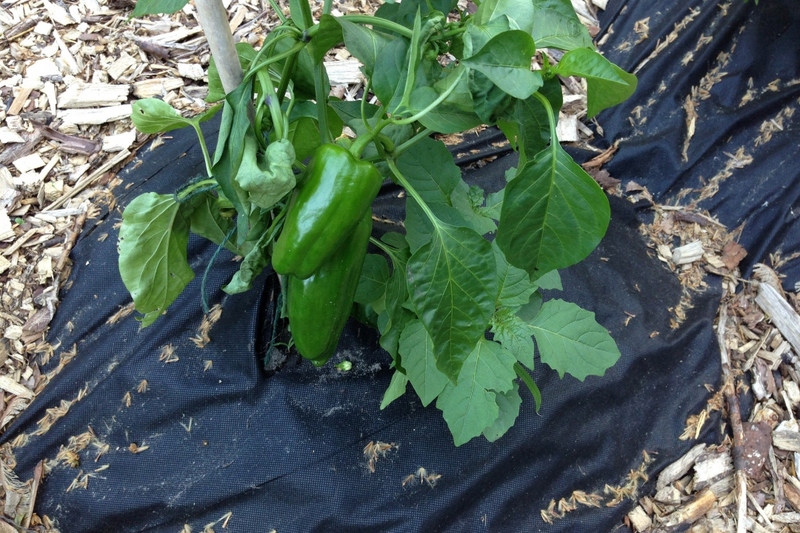 Your peppers are fine with generous watering once a week if they are well mulched. After sowing, water every other day for a few weeks with a light mist in order to keep the soil slightly damp. Mulch between the plants one to two weeks after the final planting with a natural mulch that holds in moisture. Ideally, leaf and yard waste works perfectly — grass cuttings, cut branches, and dead leaves! This will limit soil evaporation and thus the need for watering and weeding. The harvest occurs from July to October with peppers that are still green at first. The fruiting trim is not at all essential, but if you want smaller amounts of bigger fruit, don't keep more than 15 per plant. After the harvest, pull up the entire plant. If diseased, don't compost it. Fertilization, like we usually advise, is used as a preventive measure at the beginning or end of winter in order for the microorganisms to have time to mineralize the organic waste you distribute. For peppers, we generally advise an additional fertilization during the growing season (such as nettle manure, not fresh manure). In any case, the pepper loves lye, thus you can indulge it by composting banana peels or by adding wood ashes.